Inclined Vibrating Screen work in a rotundity trajectory, and is of many layers and high efficiency. The vibratory screen adopts the barrel type of eccentric shaft vibration exciter and eccentric block to adjust the swing. 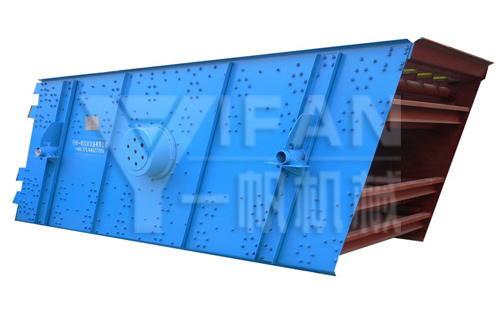 The screen is featured with the following characteristics, the screening line is long and specification of materials screened is various, and it is also of reliable structure, strong exciting force, high screening efficiency, low vibrating noise, long durability, convenient maintenance, safe operation, etc, and the vibratory screen is widely used for screening in wide range including mines, building material, transportation, energy sources, chemical industry, etc. YK Series Inclined Vibrating Screen is a high efficiency machine that absorbs Germany Technology. It is applied to coal dressing, ore dressing, building material, electric power, and chemical industries. Inclined Vibrating Screen should start when there is nothing on the screen surface, and should avoid starting the machine with materials, when the material running steady, then can feed. Stop feeding before stop the machine, and keep there is no material on the surface then stop the machine. Observe the operation of the machine when it is running. If there are abnormal movement or unusual sound, we should stop the machine and examine it, find the causes, and eliminate the troubles. Note:The processing capacity listed in the table is based on dry classification of limestone,which bulk density is 1.6t/m³.The listed capacity is only for reference.The actual data need to be fixed by tech department according to worksite situation.